If you look closely at the leaded glass on the old Broadway Hardware building on Westport Road, you can make out the name “Little’s Hall.” The location was a popular spot in the early 1900s, hosting political events, dances and club meetings. Photo courtesy Google Maps 2017. 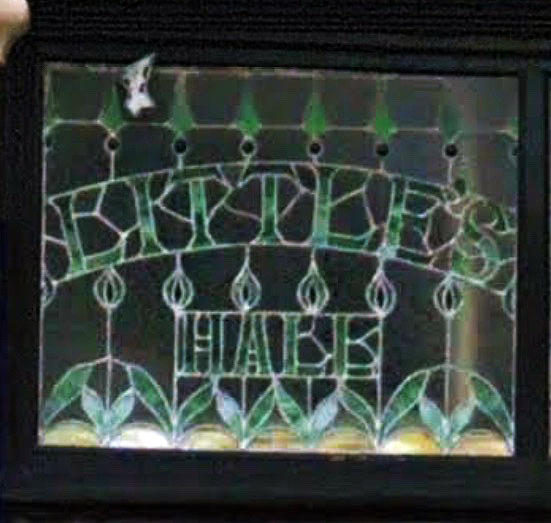 A careful observer of things in Midtown, Diane Capps, noticed the lettering on a window at 313 Westport Road and noticed the name “Little’s Hall” was embedded in the leaded glass. 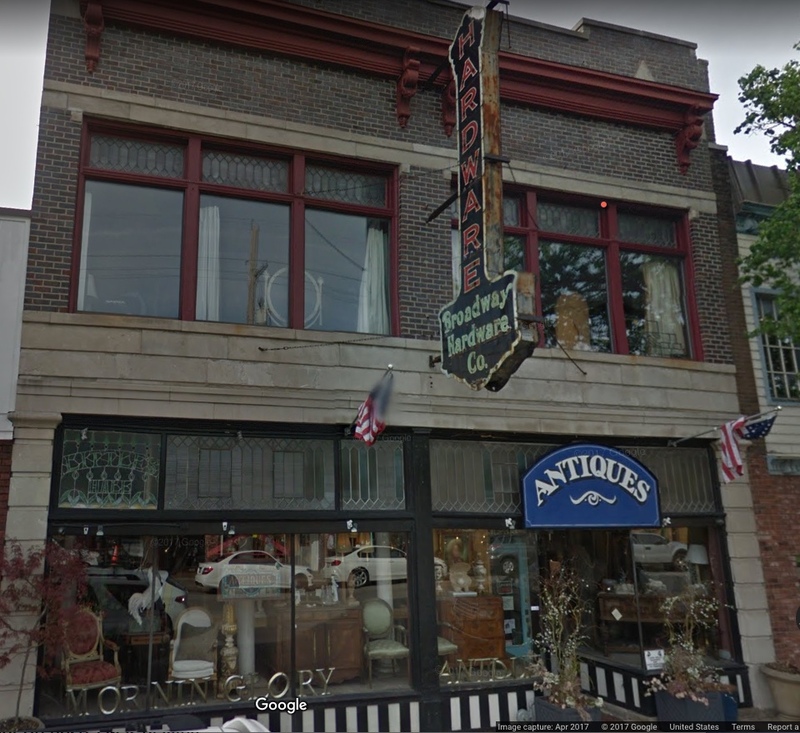 The first floor of the building is now used as an antique store, and the sign for a long-term tenant, the Broadway Hardware Company, is still there. Little’s Hall was probably the space on the second floor, still used for events. Information about Little’s Hall is scant. The first mention in newspaper archives came in 1909, when the space was being used as a dance hall. Several clubs such as the Candle Light Club and Shawnee Camp No. 8136 met there in 1909 and 1910. Perhaps the most interesting glimpse into Little’s Hall history came in 1911, when the Westport Improvement Association held its annual reception and ball there. The event drew both old settlers and new residents of Westport, and the 800-1000 attendees crowded into the dancing space. In fact, it got so crowded that organizers opened up space across the street at Croner’s Hall, where another orchestra was playing. The Dec. 31, 1911 Kansas City Star reported that some of Westport’s oldest residents were on hand. 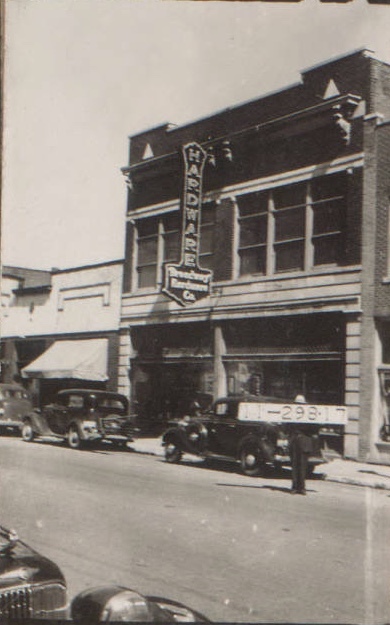 When this 1940 tax photo was taken, 313 Westport Road had been used as a hardware store for at least a decade. “W.M. Johnson was there, who has lived in Westport since he was 2 years old – and that was in 1847. And George Washington Vogel was there, 70 years old and born in Westport, which is reaching back pretty far. And Mayor Brown was there to lead the grand march; and the Watts Brothers, Stubbins and Dobson, to fiddle and show how Dan Tucker really danced in the days when that worthy fell in the fire and kicked up a chunk on that celebration occasion of tipsiness. And William Schmittner of the clarion voice was there to call the figures, and the McLeods to skirl the “hieland” pipes in the reels. The final mention of Little’s Hall that I have found is a 1918 political meeting. I grew up at 3952 Central. I used to shop at the hardware store with my dad in the 50’s. Across the driveway next door this building was Westport Bank. I started my very first bank account there in 1963. I had an account there until the mid ’90’s.